A measure of the benefit one derives from distributing or investing his/her assets in one way as opposed to another. Allocative efficiency is difficult to measure, especially in advance. However, rational economic actors attempt to maximize their allocative efficiency. See also: Incremental internal rate of return. Fig. 7 Allocative efficiency. (a) A normal profit equilibrium under conditions of perfect competition. (b) The profit maximizing price-output combination for a monopolist. equilibrium under conditions of PERFECT COMPETITION with price being determined by the intersection of the market supply and demand curves and with MARKET ENTRY/MARKET EXIT serving to ensure that price (P) is equal to minimum supply cost in the long run (AC). By contrast, where some markets are characterized by monopoly elements, then in these markets output will tend to be restricted so that fewer resources are devoted to producing these products than the pattern of consumer demand warrants. In these markets, prices and profit levels are not consistent with the real resource costs of supplying the products. Specifically, in MONOPOLY markets the consumer is exploited by having to pay a price for a product that exceeds the real resource cost of supplying it, this excess showing up as an ABOVE-NORMAL PROFIT for the monopolist. Fig. 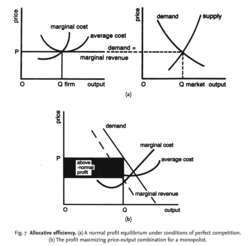 7 (b) depicts the profit maximizing price-output combination for a monopolist, determined by equating marginal cost and marginal revenue. This involves a smaller output and a higher price than would be the case under perfect competition, with BARRIERS TO ENTRY serving to ensure that the output restriction and excess prices persist over the long run. See PARETO OPTIMALITY, MARKET FAILURE.